I have collected cars for 35 years.. This is one of my classic from my personal collection, see others at www.gccc.us. This car was recently painted using the old lacquer method with the original color. According to the prior owner, the 79,000 miles are original along with the 454cid, 365 HP BIG BLOCK motor and an automatic transmission. It has never been taken apart and it's in excellent condition for a car its age. And while it still has the original seat covers that are very nice, it also comes with new seat covers as well. ADDITONAL EQUIPMENT ??? T-Top ??? A/C ??? Power Brakes ??? Power Steering ??? AM/FM Radio w/CD Player OPTIONAL EQUIPMENT ??? Rare Removable Rear Window (discontinued 1-year later) This car is a true survivor and in GREAT condition. It is like a time capsule which takes you back to 1971 just by standing next to it. It is one of 5097 Big Block automatic transmission corvettes manufactured in 1971 and is actually more rare than the same Big Block 4-speed transmission corvettes that were made the same year. 1971 was really the last year that GM and Chevrolet made higher compression more powerful engines and this car has the highly sought after high horsepower BIG BLOCK motor. 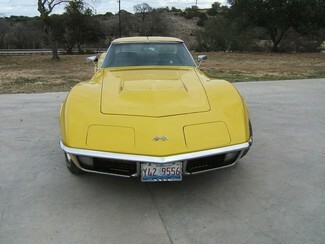 One could argue that it was the last true muscle corvette. Underneath the car there is a little superficial surface rust on the frame but it's where you would expect it, and there are also 2 one inch areas on the bird cage as well. The frame, undercarriage, and pillars are also in GREAT condition. This car will make an excellent investment opportunity and if you watch the auctions on TV you'll understand what a good investment the early muscle C3's are and will continue to be. HISTORY In 1971, a special-purpose "Big Block" V8 was available that produced 425 horsepower. But 1971 was the last year for "gross" horsepower ratings. The industry changed to a "net" rating system that accounted for the exhaust system, vehicle accessories and other components. It provided a truer measure of an engine's performance and is still used today. FRESH NEW PAINT !!! !